Find these recipes and others on my Recipes page! 21 comments on "MPM: Aug 20 - Sept 4"
Menu planning is so hard. We often end up eating the same dishes repeatedly simply because we can’t think of anything else to make. 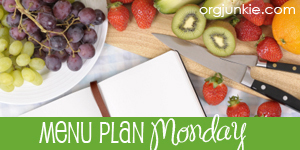 Thanks for posting your weekly menu plan, it is of great help.